In last week's post I talked about ways to keep the inspiration channels open to help prepare for epiphany-like ideas and one of my suggestions was to keep moving. Since I am constantly trying to bring more movement into my daily life, and since I discover daily how important movement is for the creative process, I thought a post entirely on that subject was in order. In late December I attended a workshop called a 'movement book club.' It was facilitated by a friend of mine and provided a unique opportunity to explore a book (The Outsider by Albert Camus) with our bodies rather than just with our minds. The first half was devoted to verbal discussion but the second half brought me right back to my drama days. The words "just walk around the space" are some of my favourite words to hear. They mean that it's time to let go of all thoughts and preconceptions, and allow my infinitely wiser body to take over. In the drama classes I took we learned to find characters through our bodies, rather than our minds. We would start walking and be instructed to allow certain parts of our bodies to lead the motion, until we found one that felt right for our character. We would be asked to speed up, slow down, try different levels (on tip-toe vs. crawling for example), and assume different positions so that we could find the shape and the rhythm of our character. I found that this worked much better than holding the script and thinking about how the character might sit or stand, or how they would move their hands. When we did the exploration with our bodies not only did it feel more natural and authentic, but it made the lines and the movements easier to remember. I really believe that our bodies know things that we might not consciously have access to and if we let them move, they will fill us in on their secrets. This isn't another New Years call to get yourself to a gym. This is just a gentle reminder that a moving body is a happy body - and movement can mean anything from stretching at your desk to dancing to scrubbing your baseboards. According to a study at Leiden University in the Netherlands, participants' performance on creative tasks went up when they were exercising regularly. 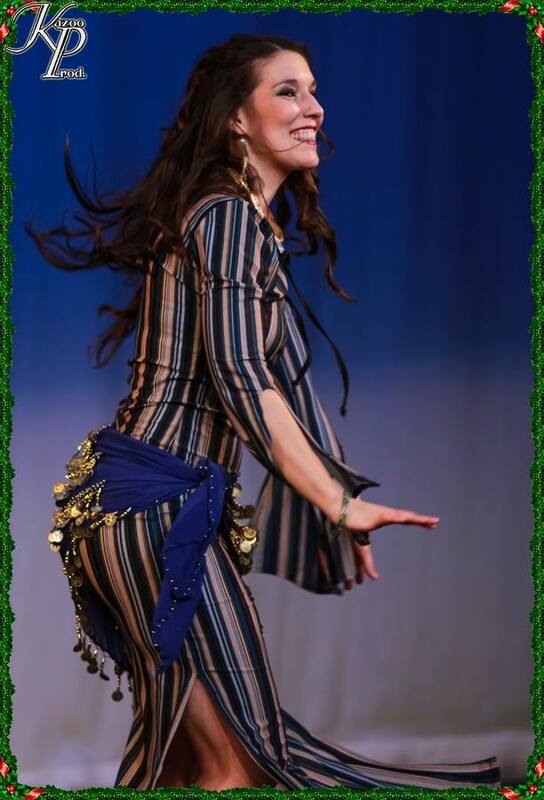 - Take a dance class: I've been studying belly dance for almost 4 years and the benefits have been significant. It's fun, it's challenging, it helps loosen one of the tightest parts of my body (my hips), and it gives me the chance to express the feeling of music with my body. I've always loved dancing and moving to music and regular dance classes keep me committed and make sure that I'm moving regularly. - If you can't commit to a regular class, put on some music and let your body describe what you hear: This is another one of my favourite activities, mostly because it means I can move in ways that aren't necessarily dance-like. It means I can twist into strange shapes and wiggle my knees and elbows and look completely crazy. Sometimes I pretend to be a ballerina, sometimes I incorporate kung fu and kickboxing, and sometimes I just jump and shake. I like to challenge myself to move every part of my body, from the top of my head, to the ends of my fingers, to my toes. It's good exercise and a great creative practice. - Take an acting or an improv class: If you're interested in learning to move in new ways, acting can open you up to a whole new world of expression. Most classes start with improv, which helps you learn to move impulsively without letting your mind talk you down. I learned everything I know about expressive movement and letting my body lead the way in drama classes and have rarely felt so free and engaged in the moment. - Try yoga: If you've never tried yoga because you think it's expensive or inaccessible or pretentious, maybe have a second look. Yes, it can be all those things, but it doesn't have to be. Look for DVDs at your library or check out Yoga Journal or Do Yoga With Me for free videos. I can't touch my toes or do half the poses the way they look in pictures, but that's part of why I love yoga. It forces me to drop my expectations about what I 'should' be able to do, and allows me to just do something. A good teacher or video has me so focused on my alignment and what each little part of my body is doing that I don't have time to think about my to do list. Giving the mind a chance to rest like this is invaluable for developing creativity. - Go for a walk: I'll let Thoreau explain this one:“How vain it is to sit down to write when you have not stood up to live! Methinks that the moment my legs begin to move, my thoughts begin to flow, as if I had given vent to the stream at the lower end and consequently new fountains flowed into it at the upper. A thousand rills which have their rise in the sources of thought burst forth and fertilize my brain. The writing which consists with habitual sitting is mechanical, wooden, dull to read.” Walking is good for us in so many ways, especially if we can do it near trees and wildlife. - Clean the house: In her book, The Creative Habit, Twyla Tharp talks about a friend of hers who couldn't write when his house was dirty. He would become obsessed with the mess and would set to work scrubbing everything clean. When he sat back down at his desk, the words flowed effortlessly. He thinks this is because the dirt becomes associated with doubt in his mind and by washing the dirt away he is removing the cobwebs from his mind. Tharp figured that it was actually just the act of getting up and moving around that made it easier. Either way - seems like a good strategy. - Make a pot of soup: While you won't burn many calories working in the kitchen, I've found that the act of chopping vegetables has become a sort of ritual for me. It's a fully engaging sensory experience and, as long as I remember to turn off the TV (Gilmore Girls on Netflix makes this hard to do) I find myself caught up in the smells, the feel of the vegetables, and the different shapes and colours that emerge as I chop. Cooking is a way for me to nourish my body, and the bodies of those I love, and is a great way to take a break from mental work. What do you think? Do you incorporate movement into your creative practice? What's your favourite way to move your body? Leave a comment below!